John Senex - The Road from Chester to Cardiff in Glamorganshire. 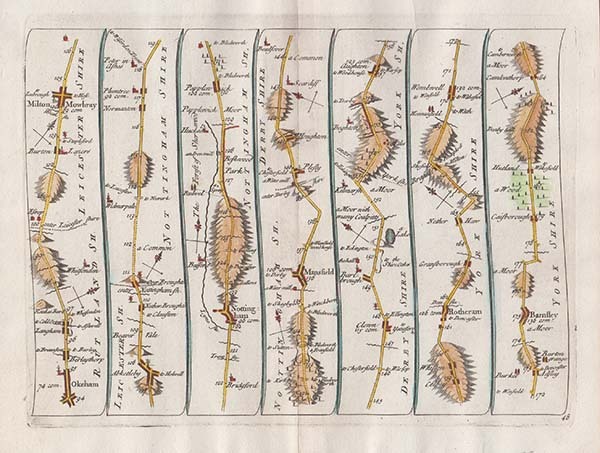 This antique strip map is The Road from Chester to Cardiff in Glamorganshire. Commencing at West Chester toWrexham, Sellatyn, Llanfyllin, Llanfelling, Newtown to Llanbeder Vunneth and then continuing on verso to Bealth, Brecknock to Cardiff. This is Plate 70 and 71 from Senex's "Actual Survey of all the Principal Roads of England and Wales". It was published in 1719 and contained one hundred maps reduced from John Ogilby's "Britannia" of 1675 with later hand colouring. This antique strip map is The Road from King's Lynn to Norwich..... Commencing at King's Lynn to Gayton, Mileham, Billingford, Norwich, Hadsko to Yarmouth. This is Plate 86 from Senex's "Actual Survey of all the Principal Roads of England and Wales". It was published in 1719 and contained one hundred maps reduced from John Ogilby's "Britannia" of 1675 with later hand colouring. John Senex - The Road from Chester to Cardiff. 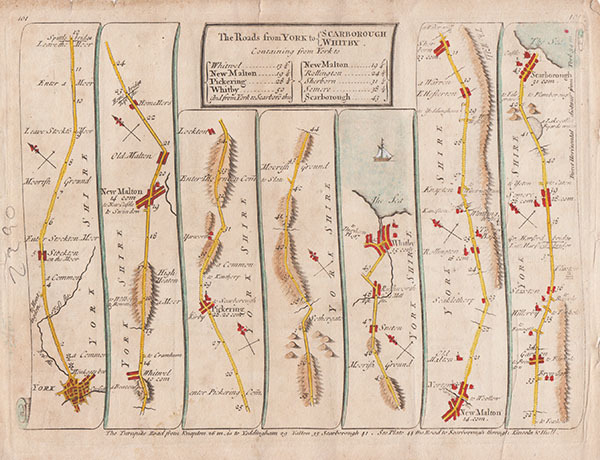 This antique strip map is the continuation of the road from Chester to Cardiff. Commencing at Llanbader Vinneth toLlanbeder Vawr to Bealt to Brecknock to Cardiff. This is Plate 64 from Senex's "Actual Survey of all the Principal Roads of England and Wales". It was published in 1719 and contained one hundred maps reduced from John Ogilby's "Britannia" of 1675 with later hand colouring. John Senex - The Road from Carmarthen to Cardigan to Aberystwyth. 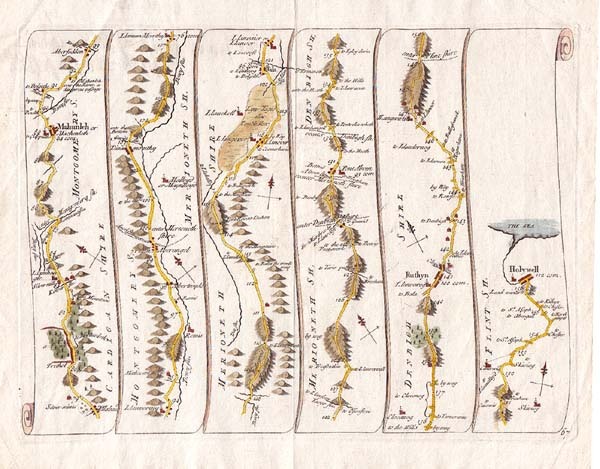 This antique strip map shows the 'The Road from Carmarthen to Cardigan to Aberystwyth'. Commencing at Carmarthen to Killvah, Killreaden, Cardigan, Llanbedr, Trevilan, Llansusted to Aberistwith. This is Plate 91 from Senex's "Actual Survey of all the Principal Roads of England and Wales". It was published in 1719 and contained one hundred maps reduced from John Ogilby's "Britannia" of 1675 with later hand colouring. John Senex - The Road from London to Holyhead. 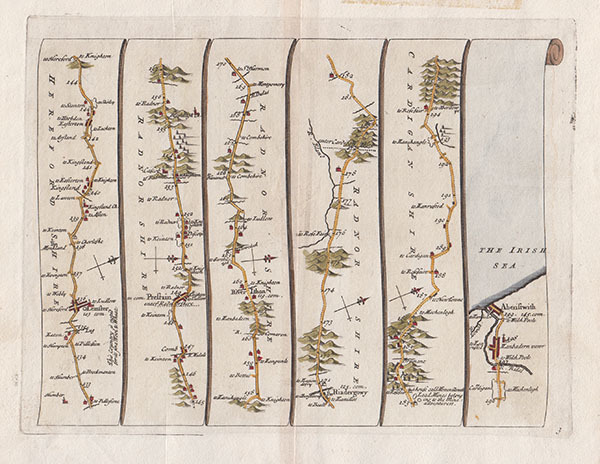 This antique strip map is the continuation of the road from London to Holyhead. Commencing at Great Haywood the to Stone, Barlaston, Woore, Bridgemere, Nantwich, Tarporley, Chester, Hawarden the to Northop. This is Plate 23 from Senex's "Actual Survey of all the Principal Roads of England and Wales". It was published in 1719 and contained one hundred maps reduced from John Ogilby's "Britannia" of 1675 with later hand colouring. John Senex - The Road from London to Aberistwith. 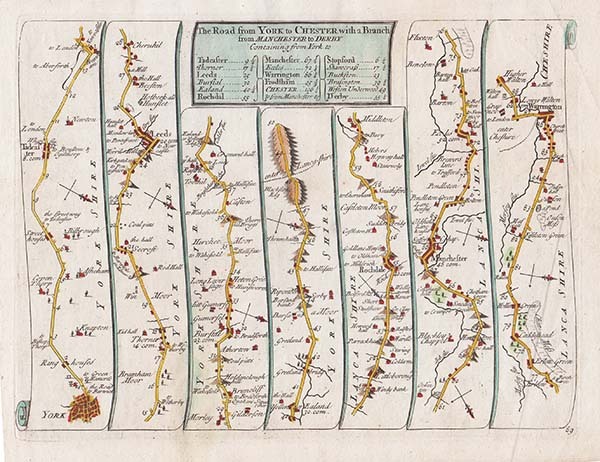 This antique strip map is the continuation of the road from London to Aberistwith. Commencing at Leominster continues to Kingsland, Presteigne, Rhayader and to Aberystwyth. 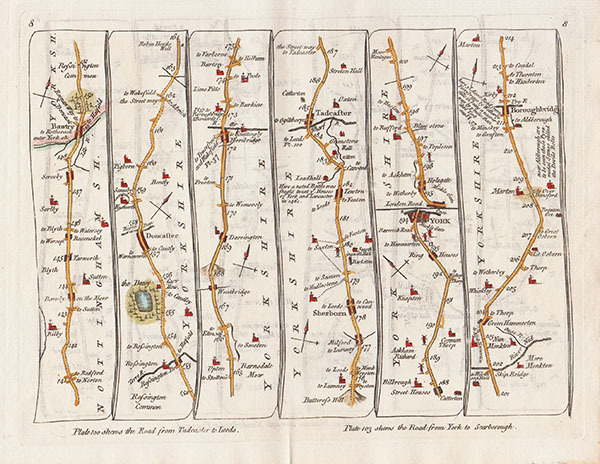 This is Plate 3 from Senex's "Actual Survey of all the Principal Roads of England and Wales". It was published in 1719 and contained one hundred maps reduced from John Ogilby's "Britannia" of 1675 with later hand colouring. John Senex - The continuation of the Road from London to St. Davids. This antique strip map is the route from Abingdon and extending to Monmouth via Shipton, Faringdon, Lechlade, Glocester, Micheldean and Colford. 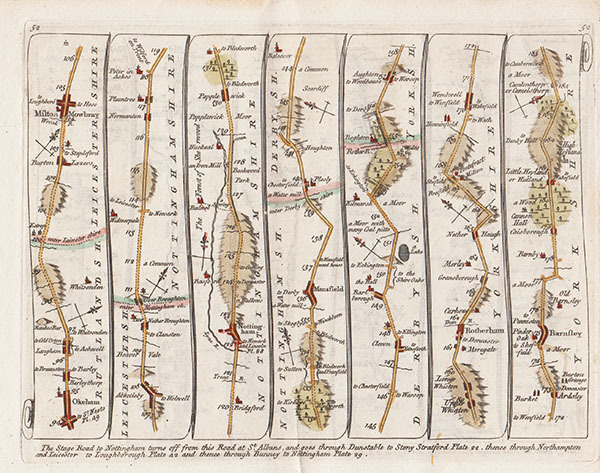 This Plate 16 from Senex's "Actual Survey of all the Principal Roads of England and Wales" published in 1759 with later hand colouring. Plate 17 on verso shows the route from New Church in Monmouthshire to Newport, Cardiff, Cowbridge, Aberavon, Burton Ferry to Swansea entering Carmarthenshire at Lloghor. John Senex -- The Road from London to Holyhead. This antique strip map is "The Road from London to Holyhead" is Plate 24 from Senex's "Actual Survey of all the Principal Roads of England and Wales". It was published in 1719 and contained one hundred maps reduced from John Ogilby's "Britannia" of 1675 with later hand colouring. This map includes the section from Flintshire to Denbigh, Conway or Aberconway, Beaumaris to Holy Head.Towcester to Daventry to Coleshall to Lichfield to Rugeley. John Senex - The Road from York to Whitby and Scarborough. 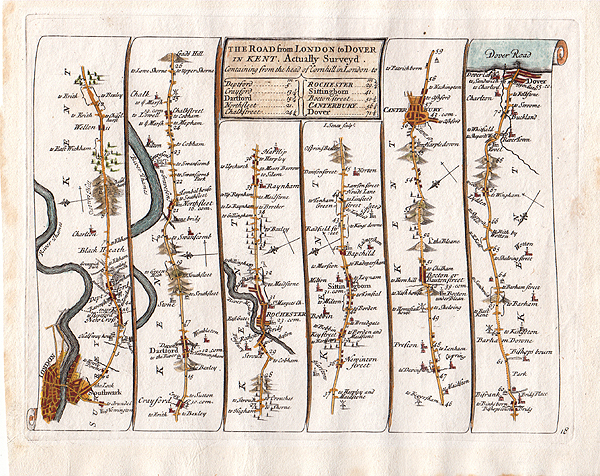 This antique strip map is the route from Northallerton Darlington Durham Newcastle upon Tyne. 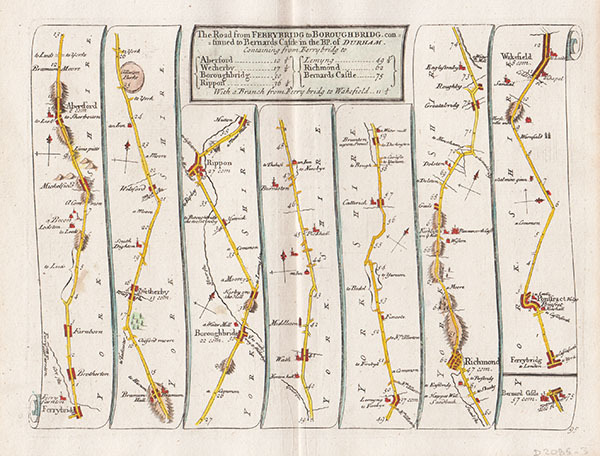 This Plate 8 from Senex's "Actual Survey of all the Principal Roads of England and Wales" published in 1759 with later hand colouring. 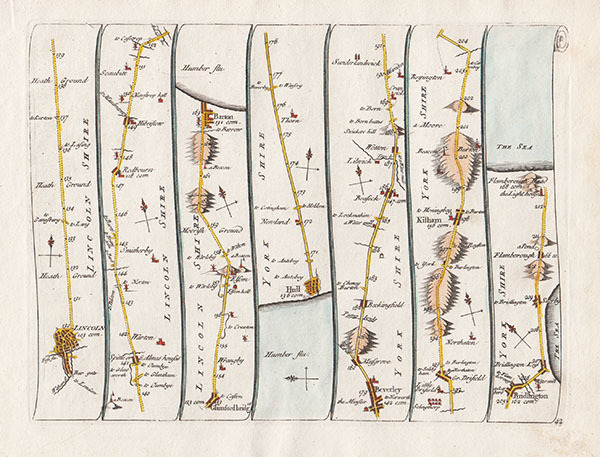 Plate 9 on verso shows the route from Morpeth to Alnwickto Barwick. 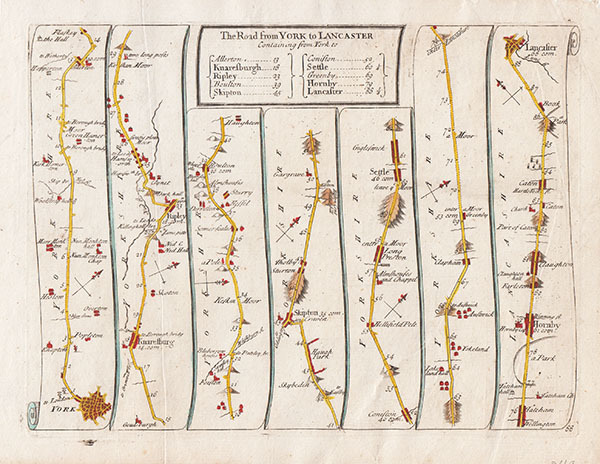 This antique strip map is " The Road from York to Lancaster" is Plate 88 from Senex's "Actual Survey of all the Principal Roads of England and Wales". It was published in 1719 and contained one hundred maps reduced from John Ogilby's "Britannia" of 1675 with later hand colouring. It shows the route from York to Lancaster via Allerton, Knaresborough, Ripley, Boultoin, Skipton, Coniston, Settle, Greenby and Hornby. Repaired tear extending from lower margin 9cms into image. Only noticeable on close inspection. This antique strip map is the route from Lincoln to Flamborough Head via Lincoln, Barton, Hull, Beverley and Bridlington. This Plate 42 from Senex's "Actual Survey of all the Principal Roads of England and Wales" published in 1719 with later hand colouring. This antique strip map is the route from Ferrybridge to Boroughbridge continued to Bernads Castle via Aberford, Wetherby, Boroughbridge, Rippon, Lemyng, Richmond to Bernards Castle. 'With a Branch from Ferrybridge to Wakefield. This Plate 95 from Senex's "Actual Survey of all the Principal Roads of England and Wales" published in 1719 with later hand colouring. John Senex - The Road from York to Chester with a Branch from Manchester to Derby. This antique strip map is the route from York to Warrington -- via Tadcaster, Leeds, Rochdale and Manchester. This Plate 89 from Senex's "Actual Survey of all the Principal Roads of England and Wales" published in 1719 with later hand colouring. This antique strip map is the road from Shelley to Kirk Burton, Dudgley Gate, Almondbury, Hutherfield, Ashley, Hallifax, Kighley, Utlay, Upper Bradle, Skipton, Rylston, Cumiston, Kettlewell, Coverhead, Woodall, Bradley, Horsehouse Chapel, Gamergill, Carlton, Melmerby, Ocklethorp, Midlam, Harneby to Richmond. This Plate 49 from Senex's "Actual Survey of all the Principal Roads of England and Wales" published in 1719 with later hand colouring. 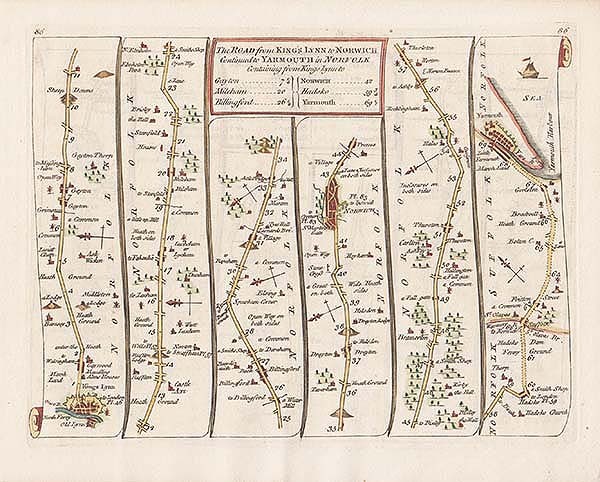 This antique strip map is part of " The Road from Oakham to Melton Mowbray, Ab Kettleby, Plumtree, Nottingham, Papplewick, Mansfield, Bolsover, Clowne, Barlborough, Killamarsh, Rotherham and Barnsley. This Plate 48 from Senex's "Actual Survey of all the Principal Roads of England and Wales" published in 1719 with later hand colouring. John Senex - The Road from Whitby to Durham. 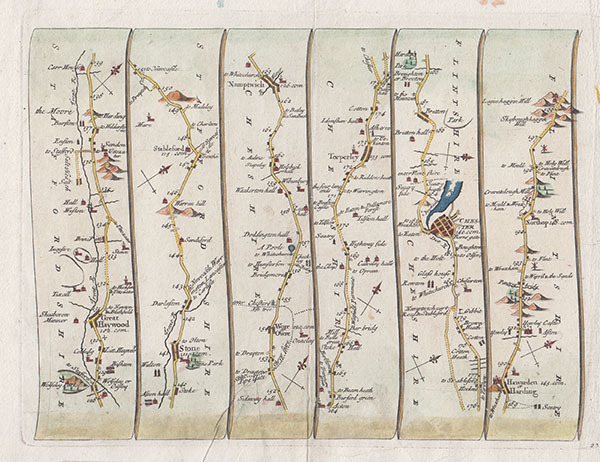 This antique strip map is part of " The Road from Whitby to Durham and is Plate 99 from Senex's "Actual Survey of all the Principal Roads of England and Wales" published in 1719 with later hand colouring. The route is from Whitby to Skallingdam, Gisbourgh, Marton, Norton, Sedgfield, Durham to Tinmouth. 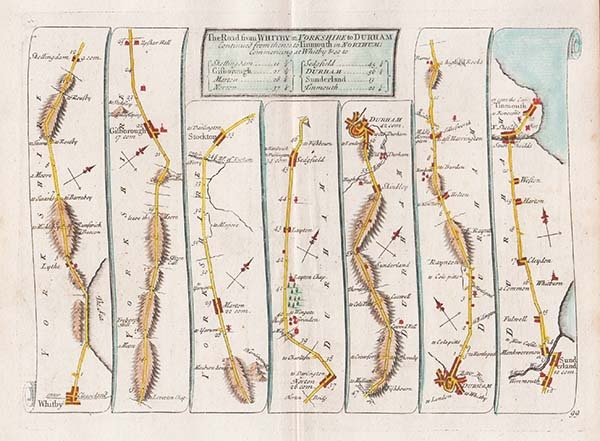 More Info This antique strip map is part of "The Road from Okeham to Richmond and is Plate 52 from Senex's "Actual Survey of all the Principal Roads of England and Wales" published in 1757 with later hand colouring. Oakham to Melton Mowbray, Ab Kettleby, Plumtree, Nottingham, Papplewick, Mansfield, Bolsover, Clowne, Barlborough, Killamarsh, and Rotherham to Barnsley. Continuing on the verso Shelley to Almondbury, Huddersfield, Halifax, Cullingworth, Keighley, Skipton, Rylston, Linton, Kettlewell, Charlton, and Middleham to Richmond. 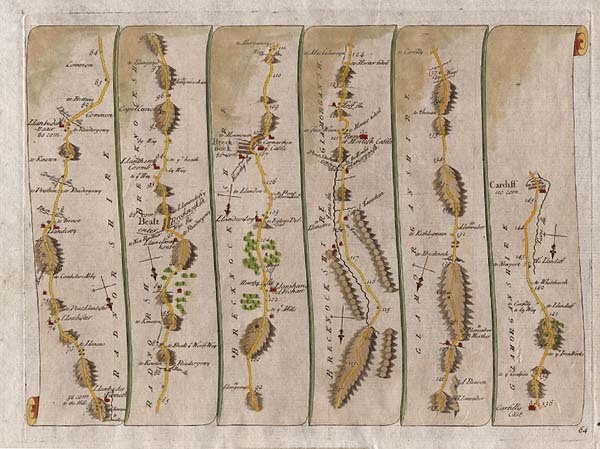 This antique strip map is part of "The Road from Okeham to Richmond and is Plate 52 from Senex's "Actual Survey of all the Principal Roads of England and Wales" published in 1757 with later hand colouring. Oakham to Melton Mowbray, Ab Kettleby, Plumtree, Nottingham, Papplewick, Mansfield, Bolsover, Clowne, Barlborough, Killamarsh, and Rotherham to Barnsley. Continuing on the verso Shelley to Almondbury, Huddersfield, Halifax, Cullingworth, Keighley, Skipton, Rylston, Linton, Kettlewell, Charlton, and Middleham to Richmond. 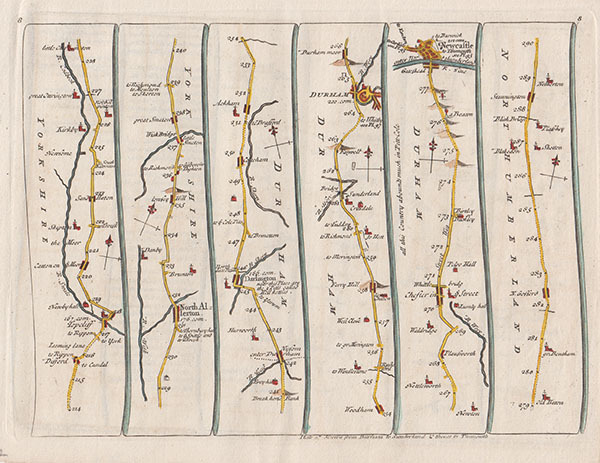 This antique strip map is part of "The Road from Barmby Moor Boroughbridge and is Plate 7 from Senex's "Actual Survey of all the Principal Roads of England and Wales" published in 1719 with later hand colouring. The map shows the route passing through the following towns: Barmby Moor, Bawtry, Doncaster, Wentbridge, Ferrybridge, Sherburn-in-Elmet, Tadcaster, York to Boroughbridg. John Senex - The Road from to Doncaster to Ferrybridge to Tadcaster to York to Boroughbridge. 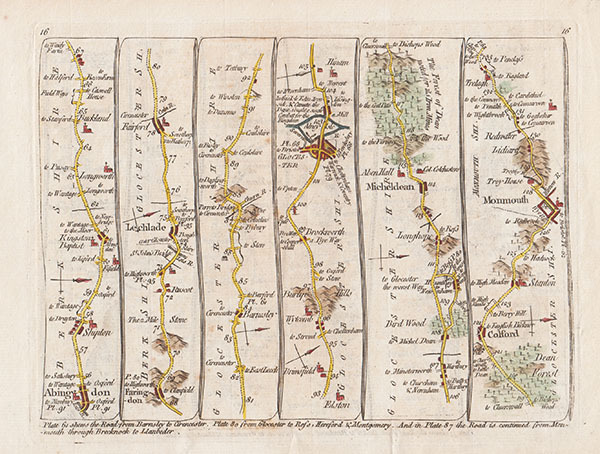 More Info This antique strip map is part of "The Road from Barmby Moor Boroughbridge and is Plate 8 from Senex's "Actual Survey of all the Principal Roads of England and Wales" published in 1757 with later hand colouring. The map shows the route passing through Barmby Moo to Bawtry, Doncaster, Wentbridge, Ferrybridge, Sherburn-in-Elmet, Tadcaster and York to Boroughbridge. Continuing on verso Norton-le-Clay to Newby, Northallerton, Darlington, Durham, Newcastle upon Tyne to Stannington. 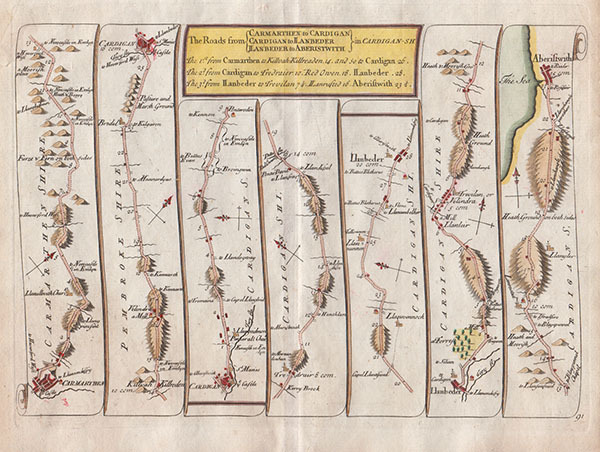 This antique strip map is part of "The Road from Barmby Moor Boroughbridge and is Plate 8 from Senex's "Actual Survey of all the Principal Roads of England and Wales" published in 1757 with later hand colouring. The map shows the route passing through Barmby Moo to Bawtry, Doncaster, Wentbridge, Ferrybridge, Sherburn-in-Elmet, Tadcaster and York to Boroughbridge. Continuing on verso Norton-le-Clay to Newby, Northallerton, Darlington, Durham, Newcastle upon Tyne to Stannington. John Senex - The Road from St. Davids to Holywell. 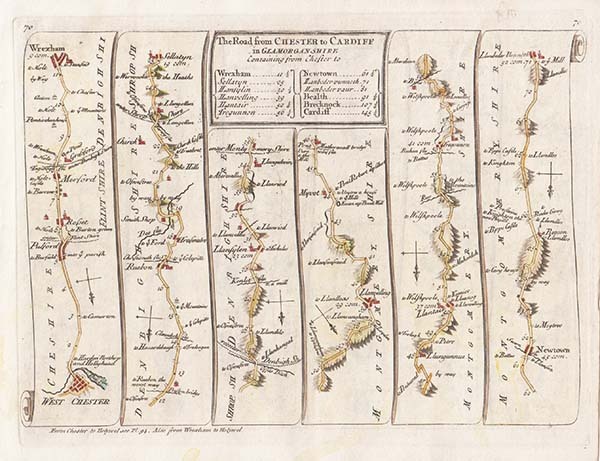 This antique strip map is part of "The Road from St. Davids to Holywell" and is Plate 67 from Senex's "Actual Survey of all the Principal Roads of England and Wales". It was published in 1719 and contained one hundred maps reduced from John Ogilby's "Britannia" of 1675. Later coloured by hand. This map includes the section from Talybont to DinasMouthy to Bala to Ruthyn to Holywell. John Senex - The Road from London to Dover in Kent. 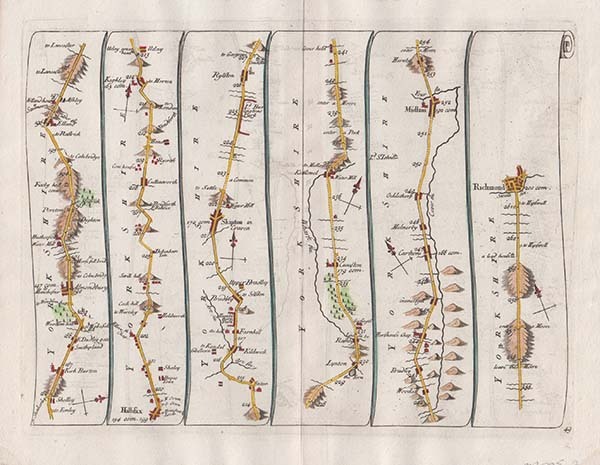 This antique strip map entitled "The Road from London to Dover in Kent" is Plate 18 from Senex's "Actual Survey of all the Principal Roads of England and Wales". It was published in 1719 and contained one hundred maps reduced from John Ogilby's "Britannia" of 1675. Later coloured by hand. John Senex - The Road from Bristol to Banbury in Oxfordshire. 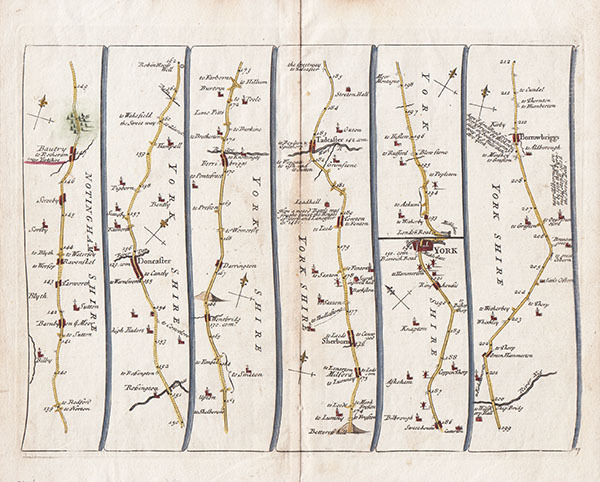 This antique strip map is part of "The Road from Bristol to Banbury in Oxfordshire," and is Plate 55 from Senex's "Actual Survey of all the Principal Roads of England and Wales". It was published in 1719 and contained one hundred maps reduced from John Ogilby's "Britannia" of 1675. Later coloured by hand. This map includes the section from Bristol to Banbury. 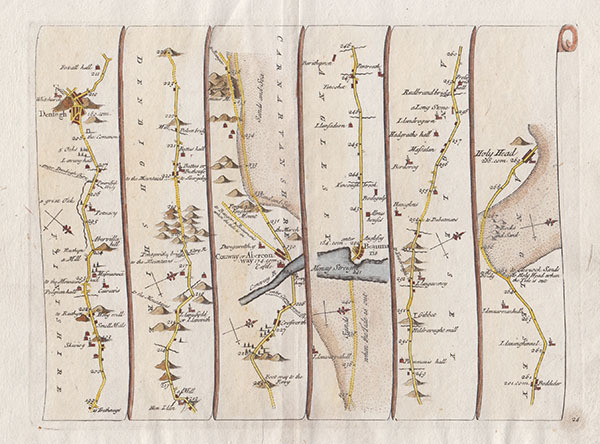 This antique strip map entitled "The Road from London to Holyhead" is Plate 22 from Senex's "Actual Survey of all the Principal Roads of England and Wales". It was published in 1719 and contained one hundred maps reduced from John Ogilby's "Britannia" of 1675. Later coloured by hand. This map includes the section from Towcester to Daventry to Coleshall to Lichfield to Rugeley.